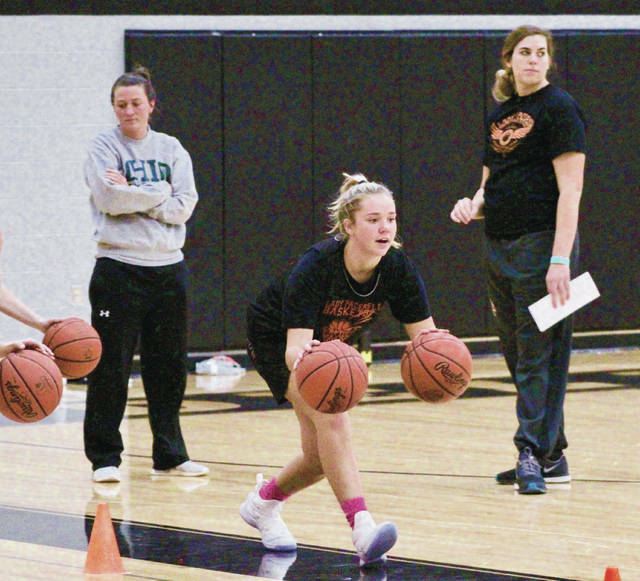 Delaware Hayes’ Piper Adkins (center), one of two captains on the girls basketball team, runs through a drill in practice as assistant coaches Chelsea Burden (left) and Lydia Hyburg (right) look on. The Delaware Hayes girls basketball team is young to say the least. The Pacers feature a roster with just one senior. But, Lou Tiberi, who enters his second season at the helm, has some experience with this youthful bunch. Hayes has 10 players on the squad that saw action last season, up from just four the previous year. His lone senior is Piper Adkins, who, along with junior Katie Smith, will captain this squad. Adkins has watched the numbers in her class dwindle from seven as a freshman to two the following season before finding herself all alone last year. Adkins believes this group is different, too. Adkins believes that Tiberi has stabilized the program and provided an atmosphere that is about more than just basketball. Sophomores Jordan Lantz, Alexis Amabile, Karli Theis and Alyssa Griner are all returning letterwinners that saw significant action last season. Lantz missed the last eight games because of injury for the Pacers, who finished 8-15 overall and 1-11 in the OCC-Cardinal. Griner is coming off a knee injury suffered in soccer. Adkins will be playing a little bit of a different role this season. She’s run the point in the past. But, with the emergence of Theis last season, Adkins will play off the ball more this fall. Juniors Abby Stephens, Nadine Hassan and Kayla Thompson along with sophomore Telijah McCollum are back after seeing action last season. Tiberi pointed to freshmen Chloe Jeffers and Sophia Nice as players who could make an impact in their rookie seasons like Lantz, Amabile, Theis and Griner did last year. Nice broke her leg in the preseason and isn’t expected back until January. She was expected to play junior varsity and provide depth on the bench for the varsity team. The Pacers open their season Nov. 24 at Centennial at 7 p.m.